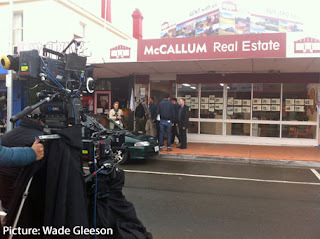 Filming outside the Rosehaven set in High St on Monday. 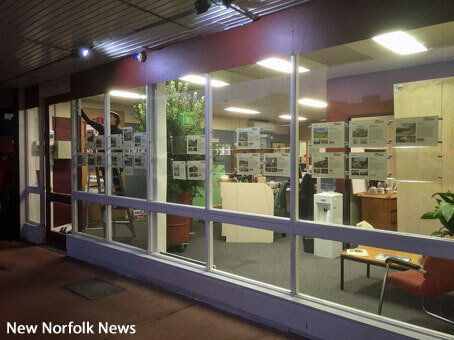 ROSEHAVEN has returned to New Norfolk for two weeks of filming in the High St location serving as the real estate agency at the centre of the ABC-TV comedy series. The former Coopers Hardware premises has been transformed into "McCallum Real Estate". Filming is being be carried out in and around the shop at 55 High St. Scenes were filmed on Monday and Tuesday and will continue today and tomorrow, as well as from Monday to Friday next week, generally between 7am and 5pm. Altus Traffic Control will manage any impacts on local traffic whenever the crew is filming outside. Rosehaven is an eight-part comedy written by Celia Pacquola and Luke McGregor. Tasmanian-born McGregor plays a man who returns home to run his parents' real estate business in the fictitious town of Rosehaven, which through the magic of television will be made up from locations in New Norfolk and Geeveston. 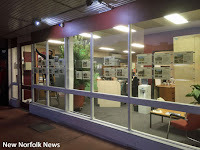 Various scenes were filmed last month at locations including the New Norfolk Historical Information Centre in Circle St and Pennyworth in Burnett St. The production team is based at the ABC Centre in Hobart and the series is expected to screen in the second half of this year.